It’s official! 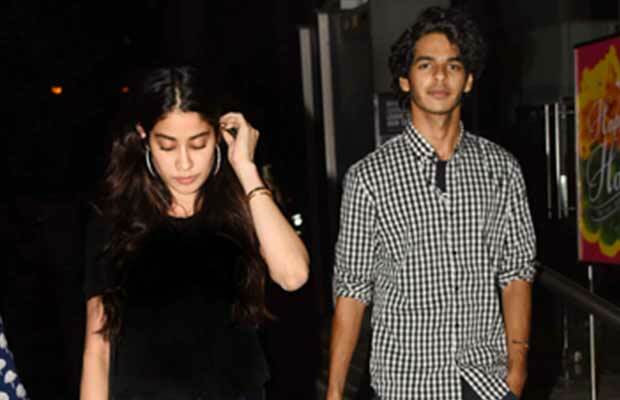 Jhanvi Kapoor and Ishaan Khattar are all set to star in the Bollywood remake of Marathi blockbuster, Sairat. The movie will star Jhanvi Kapoor and it will be her big debut. Fans are excited to see Sridevi’s stunning daughter play the part of Archana Patil. Her co-star is another star kid, Shahid Kapoor’s 21-year old brother Ishaan Khattar.Ishaan is currently working on his debut film with Majid Majidi, Beyond The Clouds. Interestingly the two debutantes are already bonding and were recently spotted together at the special screening of Baywatch. Now we smell the brew of Jhanvi Kapoor at Karan Johar’s birthday bash and the two star kids being bonding over lunch and movie dates! Rumours are rife that after Badrinath Ki Dulhania, this film will also be directed by Shashank Khaitan. The music is expected to be composed by Ajay-Atul who have originally composed the music for Sairat’s Marathi version. They have previously composed music for Dharma’s Agneepath as well. Shashank Khaitan and Ajay-Atul seem to be Dharma Production’s new favourites. It was felt that Dharma Productions can’t be considering Jhanvi for the remake of the Marathi superhit. We all know that the young fashionista, who makes several heads turn wherever she goes, is too glamorous to play a village belle. But looks like Jhanvi has taken up the challenge and it will be interesting to see how she rises to the occasion. Knowing her mother Sridevi’s acting talent, it shouldn’t be difficult for Jhanvi. Sairat, a romance set in a caste heartland of rural Maharashtra became one of the biggest hits of 2016. The film starred newcomers, Rinku Rajguru and Akash Thosar. Itwas also the first Marathi film to join the 100 crore club. While the Sairat remake may well be Jhanvi’s debut in Bollywood. And it will be Ishaan’s second venture after Majid Majidi’s Beyond The Clouds. Deepika Padukone and Kangana Ranaut had been considered to play the lead in Majid’s flick. However, both did not end up being a part of the cast. Anyway, we are excited to see the two star kids together in such a grand venture! We wish them good luck! Previous articleYou Will Be Surprised To Know How Salman Khan Shot Emotional Scenes For Tubelight!